Studies of the cells and genes of the nematode C. elegans have become a cornerstone of current biology. A classic 1988 Cold Spring Harbor monograph, The Nematode Caenorhabditis elegans, described the basic genetics, anatomy and development of the organism. Now, in that authoritative tradition, comes C. elegans II -- not a second edition but a book that breaks new ground and defines the current status of the field, providing a detailed molecular explanation of how development is regulated and the nervous system specifies varied aspects of behavior. 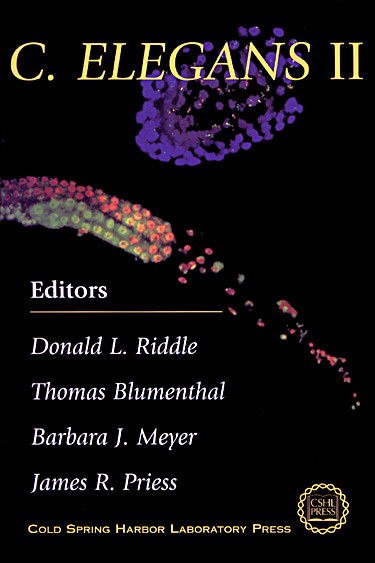 This volume is a must for any investigator doing worm studies but it has been written and rigorously edited to illuminate for a wider community of investigators in cell and molecular biology who should know how new knowledge of C. elegans relates to their own specialty.
. As with all model systems, a great deal of what is learned from C. elegans is likely to be applicable to other organisms. Therefore, anyone with an interest in cell and developmental biology, regardless of their area of specialisation, would benefit from reading C. elegans II." Worm II is excellent. It makes one eager for Worm III." the book is a must for any C. elegans researcher, and probably should find a place in any biology department library as a reference for students and staff."